Besides a quick Instagram shot of the stunning dish you're about to eat, taking out your phone or other mobile device during dinner at a high-end, Michelin-starred restaurant is, well, probably discouraged. One such restaurant in San Francisco, however, is actually encouraging you to use an iPad during your meal -- as a plate, that is. Really. Quince, an upscale tasting menu-only restaurant that boasts three Michelin stars, recently started serving a dish called "A Dog in Search of Gold," which comes served on the screen of an iPad Pro, according to a report by Eater. 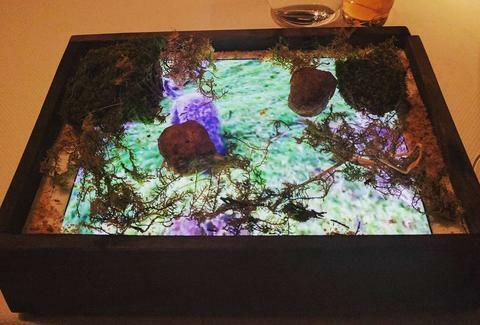 As Chef Michael Tusk explained in a Facebook post responding to the sudden media attention, the unconventional "plate" features a video of a Romagnolo dog hunting for and discovering a truffle with the food -- a white truffle fritter, salt roasted celeriac and roasted porcini mushroom, and crispy chestnut puree and roasted chestnut -- layered right on top. "The idea was simply about taking the guest on a voyage to being out truffle hunting and then having a moment when the truffle is dug from the ground," Tusk said in a statement. 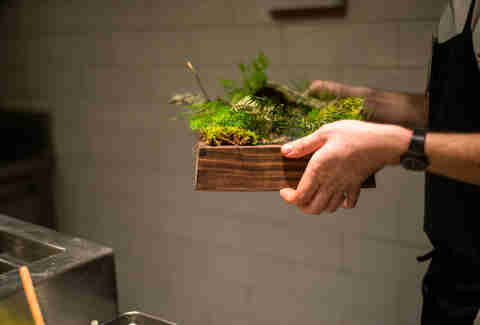 "The iPad and the custom walnut box it rests in combine a little bit of gastronomy, technology, education and whimsy. As to the construction and design of the box we commissioned local wood worker and friend Luke Bartels to create a housing for the IPad -- a simple frame with a plexi glass cover that protects the screen. The food does not directly sit on top of the iPad. The removable plexi sheath is washed and sanitized after every use in keeping with all other plate ware." This should go without saying, but you probably shouldn't try using your iPad as a plate unless you've got some sort of protective barrier between your food and the fragile screen. You know, because the folks at the Genius Bar probably won't be pleased if you come in with truffle aioli stuck in your ports and button enclosures. Tony Merevick is Cities News Editor at Thrillist and thinks this would be fun with one of those coy pond apps that let's you makes ripples in the water and poke the fish. Send news tips to news@thrillist.com and follow him on Twitter @tonymerevick.